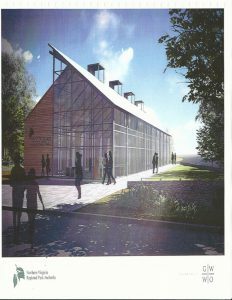 To appropriately commemorate the struggle for women’s voting rights, the Turning Point Suffragist Memorial will be located in southern Fairfax County, Va., within the new cultural area of the Occoquan Regional Park overlooking the Occoquan River—a site that will become a destination for guests, tourists, scholars, students, and historians. As envisioned, the garden-style memorial will be a cornerstone of the planned park development which will include a waterfront banquet facility, enhanced marina, amphitheater, brick kiln and control house, restrooms, and a new parking area. 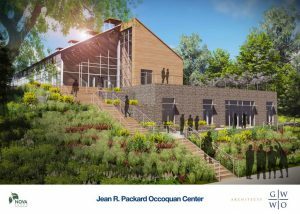 The Jean R. Packard Occoquan Center design features an exquisite, windowed, multipurpose building expected to primarily function as a banquet facility that will also include a café and educational center. Information pertaining to other local history will be on exhibit. The design image at the left shows the front of the Packard Center as viewed from the memorial and gardens location. On the right, the design of the Packard Center as viewed from the river shows the enhanced water front and cafe location.